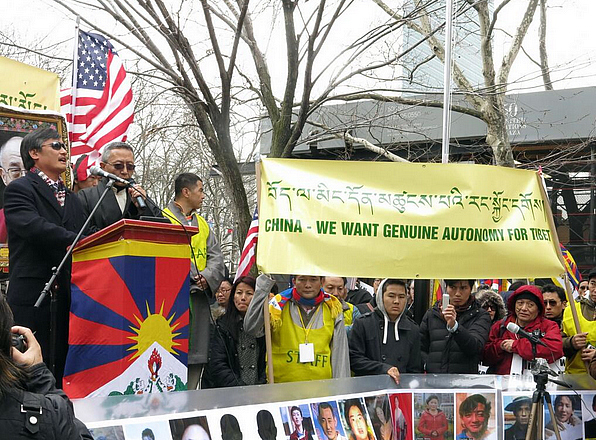 The image above, taken in New York on March 10 during the rally in commemoration of the 1959 Lhasa Uprising exemplifies the sad confusion which is blighting the Tibetan cause, as it is pressed beyond the boundaries of occupied Tibet. Let’s begin with the event itself, a date in the heart of all Tibetans, a moment to remember the sacrifice, courage and determination of the Tibetan people, and recall their just struggle against Chinese tyranny. Above all it is a day dedicated to promoting Tibet’s national freedom, a reminder to the world that despite China’s claims Tibet is an independent nation under illegal and violent occupation. This central message is best symbolized by the profusion at the world-wide March 10 rallies of the Tibetan national flag, that most colorful representation of Tibetan sovereignty and the hope of Tibetans to regain independence. However what’s this we see? A professionally made banner proclaiming that Tibetans are not seeking national freedom but something far less, an objective sought by Doctor Lobsang Sangay and his colleagues in the exile Tibetan Administration. This slogan,which runs entirely counter to the political demands and protests of Tibetans inside Tibet, who risk their freedom and lives to demand Tibet’s independence, appears to be under the charge of officials associated with the New York rally, wearing high-viz jackets emblazoned with the word ‘Staff’. Would it be too unlikely to wonder that this banner was organized via individuals close to the exile Tibetan Administration and approved by those who arranged that event? Perhaps the Office Of Tibet New York had some role to play in orchestrating the prominence of this appeasing declaration? That sound too conspiratorial for you? If so think again and recall that Lobsang Sangay is actively seeking accommodation with the Chinese Regime and has gone on record as stating that he does not wish democratic rights even for Tibetans, only the application of communist Chinese law on autonomy! See HERE What a surrender that is, and a betrayal of the hopes and resistance of Tibetans inside Tibet. Apart from being a cynical contrivance designed to peddle the official line of the Dharamsala based Administration the presence of such treacherous and unrepresentative slogans reveals the extent of the confusion and absence of political unity that saturates the wider Tibetan movement. It is particularly disappointing to see Tibetans in exile blind to the consequences of promoting such a message, and ignorant of the conflicting signals being presented. Instead of a single and determined voice, in solidarity with the struggle waged in Tibet, the photograph above reveals fracture and distortion. 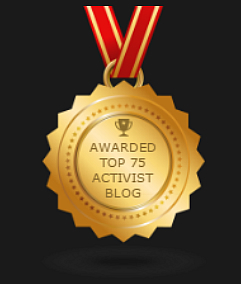 The degree of unawareness on display is frightening and suggests that some people act more as unthinking automatons than driven and conscious activists. Why do we suggest this? Well look carefully at the scene above, one of the Tibetans who presumably agreed to display this message of surrender is draped in the Tibetan flag, a symbol of independence that runs entirely counter to the dubious benefits of so-called autonomy! A condition under which the same flag would get you tortured and jailed! Yet is that person even aware of such a glaring contradiction? In wearing his nation’s flag is his heart truly dedicated to national freedom, if so how in any justifiable sense can he endorse a condition that submits to rule by China and rejects Tibetan nationhood? We must presume that as a Tibetan he is fully aware that in Tibet the cause being so courageously pressed is for an independent Tibetan nation, if he is then how on earth can he agree to promote an objective not being sought by his own people? He stands there blank-faced yet aware of the camera, while just a few feet from his gaze is a series of images depicting Tibetans who have self-immolated not one did so shouting, from the flames which engulfed them, for ‘genuine autonomy’. Their demands were clear and consistent, national freedom for Tibet and support for the Dalai Lama. Would it be too fanciful to consider that such glaring discrepancies on display would appear to have by-passed his attention, or perhaps these differences do not trouble his thinking? Then again it may be we are witnessing a conformity at work, a sense of loyalty to an Administration, an obligation to be seen to be dedicated towards the exile Tibetan leadership? Meanwhile in occupied Tibet his countrymen and women are facing down Chinese terrorism to assert Tibetan independence. That reality seems to have been ignored and marginalized at the New York rally. Was it airbrushed from existence by order of Lobsang Sangay and his fellow appeasers who regard the issue of independence an irritant in their efforts to placate he Chinese regime? What a sadness that good-hearted Tibetans are being exploited as part of such manipulation.